SpotifyTube.com was a Spotify to MP3 online conversion website which could help Spotify music lovers to find corresponding Spotify tracks on YouTube and download them as MP3 in a few clicks. However, the website is dead and the service is gone because of various reasons. 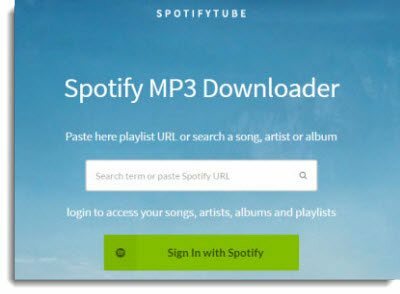 In this article, we will tell you the story of SpotifyTube.com and introduce Spotify Music Converter as best alternative which can help you download Spotify tracks as MP3 or M4A using either Spotify Free or Spotify Premium. SpotifyTube.com used to be an online service which can help you to find Spotify tracks on YouTube and download them as MP3 in a few clicks. Below is the cache of search result of SpotifyTube.com, and the screenshot helps you to know what SpotifyTube was. The SpotifyTube's owner also told to the public why this Spotify to MP3 online converter was created. The primary motivation behind Spotifytube was my friend that was trying to make an audio CD to play music in his car. He asked me for help because he has a Spotify premium account and can download all his tracks for offline use. We figured files are located on his hard-drive, but we couldn't find a way to access the encoded files containing the audio files. We've been reading about how Spotify protects and encodes their music preventing users from downloading the audio files. We looked for a solution online, but it seemed there isn't any Spotify downloader available online. We figured we can find Spotify tracks on Youtube and convert Youtube videos to the mp3's without doing any harm to Spotify. To our surprise, it worked so well that we wanted to give other people way to convert their Spotify. Using the website to download Spotify songs as MP3 was easy. Just sign the website with your Spotify account, search any song you want to download or copy the link of Spotify song, album or playlist and paste into the searchbox, then results will be displayed and you can click download button to start downloading the songs. We don't know why the owner stopped the website. It may be technology problems because the owner had to follow the Spotify updates and make corresponding changes or the risk of lawsuit because it's illegal to download massive amount of music from unthorized websites. Or Spotify simply blocked the website or the owner had no time to manage. The death of this Spotify to MP3 online conversion service is really a pity, however, there are many alternative ways to help Spotify users to get Spotify music as MP3. 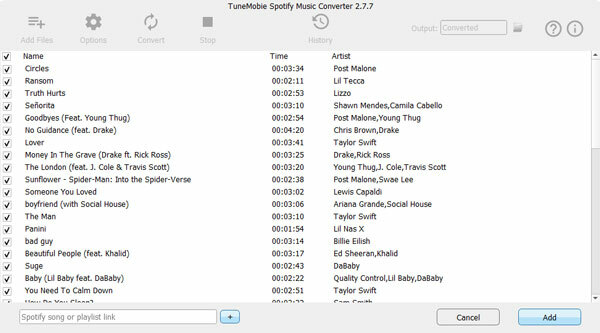 And TuneMobie Spotify Music Converter is absolutely the best alternative of SpotifyTube.com. 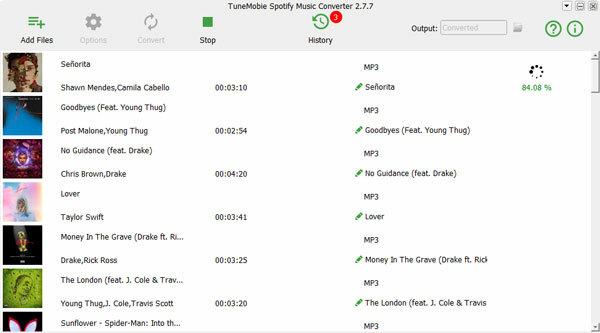 TuneMobie Spotify Music Converter is intuitive and easy-to-use and help you download a bunch of Spotify songs in only a few clicks. It's available for Windows and Mac and fully supports latest Windows and macOS Mojave. Follow the steps below to download your favorite Spotify songs, albums or playlists. Step 2: Add songs, albums or playlists from Spotify. There are two ways to add music source from Spotify. You can either drag from Spotify to Spotify Music Converter directly, or copy the URL by right-clicking the songs, albums or playlists in Spotify and paste the link in left bottom of the program interface after clicking "Add Files" button. Step 3: All the songs in the playlist or album will be checked by default. You can uncheck the ones you don't want. Step 4: Choose output folder and output format. By default, 320kbps MP3 will be used and you can click Options button to change. Step 5: Now simply click Convert button to start downloading the Spotify songs, albums and playlist. After downloading, you can click History button to check the downloaded songs. Then you can add to iTunes library and sync to iPod Nano or iPod Shuffle, or copy to PSP, Sony Walkman or any MP3 players and enjoy them without limitation. 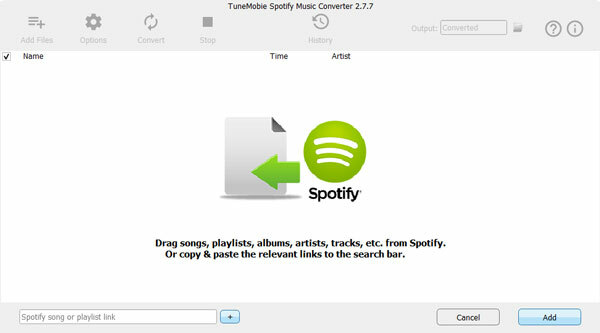 Though Spotify Music Converter is not an online Spotify to MP3 conversion website, it can download all songs from Spotify directly, as you know, not all songs on Spotify are also available on YouTube. And you don't have to login your Spotify account on other website which can keep you on the safe side. If you used SpotifyTube.com before and want to find an alterantive, then Spotify Music Converter is your best choice. Download the free trial version to have a try now!